March 27, 2018 Kids, Win 29 Comments on ABC Kids DVD Giveaway! ABC Kids have release some great DVD’s during March, and I have two of each of these six fab DVD’s to give away. Born out of the richly imaginative books by award-winning design team, Meomi, the Octonauts TV series combines team action adventure with dazzling CGI animation to transport pre-schoolers into a world they can’t ordinarily visit: the ocean. Excitement spreads across Sodor with the arrival of a new and unusual engine. Worrying they’ll be replaced by the fast and modern Hugo; the engines fail to be good friends by not making him feel welcome. When they stop to listen, they realise that Hugo is a very special engine who truly belongs on the rails. There must be something in the air because everyone on Sesame Street is singing! In “Sesame Street the Musical,” Rosita and Elmo have a play date, but keep missing each other. Can they find their way back together with a song, or will their melody fall flat? Fireman Sam celebrates real-life heroes and is a trusted and exciting brand that has stood the test of time. Six animated adventures featuring Pontypandy’s favourite fireman. In this instalment, the fire department comes to the rescue when a runaway train catches fire with a science class on board. Greendale begins to feel like the Wild West when a mischievous sheep escapes and Pat and the children have to round him up! The most successful children’s entertainment group in the world has released a collection of their most loved clips! Anthony, Emma, Lachy and Simon have picked their favourite songs for you to enjoy on The Best of The Wiggles! With catchy tunes that are instantly memorable and seen on TV screens across 190 countries, you will be up and wiggling in seconds! 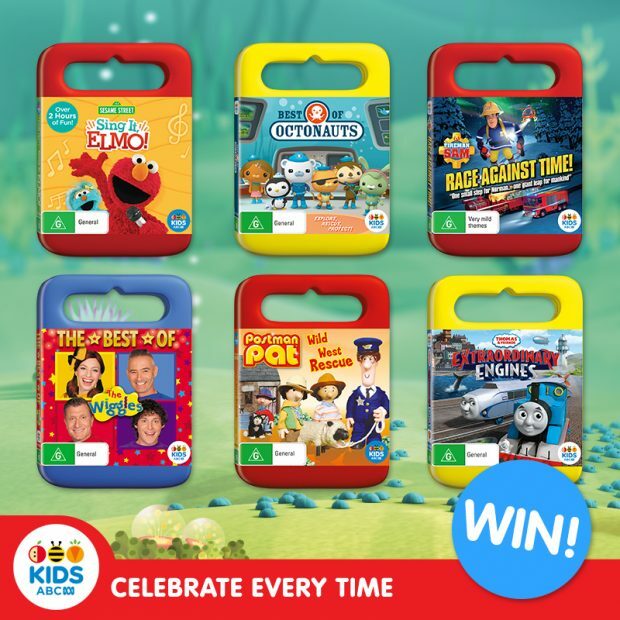 Win one of these awesome DVD’s from ABC for Kids! I have two of all six DVD’s to giveaway. Tell me below in 25 words or less which one you want to win and why? Sesame Street: Sing it, Elmo! Competition ends 24 April 2018. Full T&Cs can be found here. Hi, I’m so excited about the chance to win my girls something special. Is the a winners list somewhere to check? Thank-you. We have so many favourite Wiggles songs. I’d love a dvd turning my grumpy little ones into happy little rockers when it’s put on. A great dvd to put on at mothers group for all the kids to get their wiggle on. Thomas & Friends: Extraordinary Engines – because my kids both love Thomas and they love travelling on trains!! Thomas & Friends: my sons adore! Extraordinary Engines’d be perfect for our upcoming trip! Postman Pat is a favourite in our house. I find myself drawn to it when it’s on tv! Post Man Pat. Miss 2 keeps pointing out his big nose. She adores his cat being allowed in the car. We are Pat fans. The Wiggles: The Best of the Wiggles, no matter how old your child is they never seem to go out of style! Sesame Street Sing It Elmo would be my choice because Elmo is adorable and highly entertaining too! I would love a copy of Sing It Elmo! Sesame Street is always a classic and it would be fun to sing along with the characters! The Octonauts, as my grandson absolutely adores this show! Postman Pat. It was my favourite growing up, and I think Little Miss would love it too. She would especially love his ‘Black and White Cat’. Postman Pat: Wild West Rescue. Postman Pat was my childhood fave, and I’d lobe to carry on that tradition for my kids. The Best of the Wiggles, the kids will love it to bits, & I know it’ll be on non-stop repeat constantly!! It’s my dream to take my girls to a Wiggles concert. They love joining in the signing, dancing and fun with their Wiggling rock stars. Seasame Street because my little boy would love singing alone with Elmo. I’d love Thomas and Friends. Since my big girl has started school I’d love to distract my small so I can have some time to myself! Thomas & Friends: Extraordinary Engines for my grandson who loves trains and who’s mum works for the railways. Perhaps creating a future passion. My 3 boys would be grinners! I love the morals, messages they send!